Once a month Immanuel Community Services (ICS) opens our doors and offers a hot nutritious meal to anyone who is hungry. We serve anywhere from 100-200 diners during this meal and despite the fact that we never know who will show up … we’ve always had enough food. The meal is served on the last Sunday of the month, when many of our neighbors have run out of money for the month and they look forward to a good meal served in a welcoming atmosphere. Our doors open at noon except in the summer (June, July and August) when we open at 11:00 am. Everyone is welcome. Most of the food is donated and we have an excellent Community Lunch Coordinator who organizes the meals. Volunteers are needed on Saturdays to help prepare the meal from approximately 9:00 am to noon. Volunteers are also needed on Sundays to help finish the preparation, serve and clean up after the meal. If you are looking for a meaningful way to give back to the community, this is a great opportunity. To volunteer for this program, please contact the ICS Director at director@icsseattle.org or call the number below. Both individuals and groups of volunteers are welcome. We are proud of serving hungry people large amounts of good food in a family-like atmosphere! We serve everyone who enters our doors with dignity and respect. Want to help us keep feeding those who are hungry? Your donation today will put food on someone’s plate tomorrow! DONATE NOW! 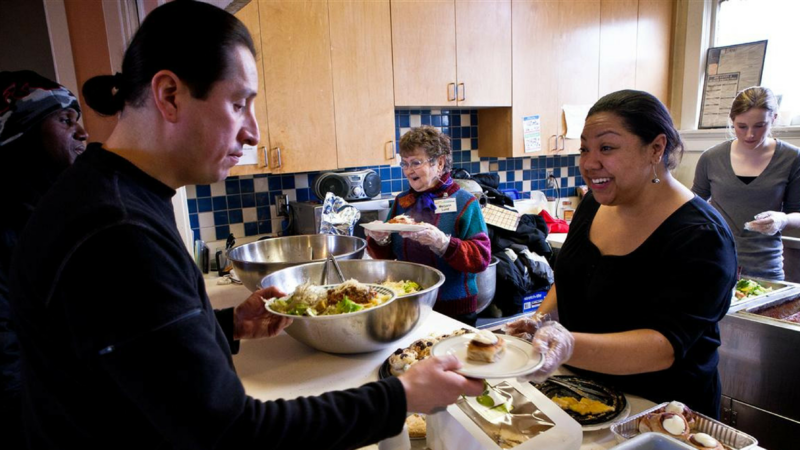 Volunteers are needed the last Saturday & Sunday of each month to prep and serve food.